A Quote- You must be slowing down Hawkeye, I've gotten twelve and you only got eleven. Acrobatics: 9D, Dodge: 9D, Escape artist: 7D, Melee weapons: 6D, Marksmanship: 8D, (SP) Widow's Bite: 10D, Missile weapons: 6D, Thrown weapons: 6D, Running 6D. Reinforced uniform (+1D+2 vs. Physical and Energy. Allows wall crawling at normal land movement), Explosives Belt: (12 Grenades) 1D per pouch. A specially designed weapon system, the Widow's bite is compact, deadly and more than capable of taking a man out at fifteen ft. She wears one on each arm and as such both of the Bites come armed with the following: Electro Blaster (5D, 3-7/25/50, Ammo: 50 each), Gas Grenade-Launcher: 5D gas grenade (15/30/45, Ammo: 6), Cable-Launcher: 50m rope, Built in Comlink. Natasha Romanov, a descendant of Russia's royal family, was found abandoned as a child by Russian soldier Ivan Petrovitch, who watched over her as she grew to adulthood and today works as her chauffeur. Natasha matured into a brilliant scholar and athlete, and the young Russian gained fame as a ballerina. Natasha married renowned Soviet test pilot Alexi Shostakov, but the couple's wedded bliss was short-lived. The KGB deemed that the two would make exemplary special operatives, and informed Alexi of the state's new plans for him. He was permitted no further contact with friends and relatives, including his wife. A distraught Natasha, believing her husband had died, sought to follow a path worthy of his heroic memory. Having anticipated such a reaction, the KGB forged its naïve new recruit into the Soviet super-spy known as the Black Widow. 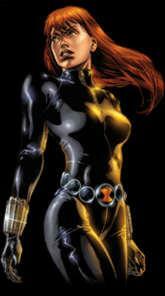 Early in her career, the Black Widow was a frequent ally of the avenging archer known as Hawkeye. However, her growing love for the future hero weakened her resolve to continue her subversive activities on behalf of the Soviets. Hawkeye refused to act as a criminal any longer; he successfully sought amnesty and membership in the Avengers, Earth's Mightiest Heroes. Following Clint Barton's about-face, the Black Widow fell into the hands of intelligence agents from the People's Republic of China, who directed her to attack the Avengers. Natasha freed herself from their programming, was reunited with Hawkeye and defected to the United States. She publicly revealed her true identity and offered her services to S.H.I.E.L.D., a worldwide intelligence and peacekeeping organization dedicated to protecting the nations and people of Earth from any and all security threats. S.H.I.E.L.D. has made use of her talents on numerous occasions. Natasha's romance with Hawkeye eventually ended, as did a subsequent love affair and partnership with the blind adventurer known as Daredevil. However, she remains friends with both men. The Black Widow was one of the few heroes left on Earth, she and her fellow Avengers did the best that they could to strike back at the Empire until the Republic could arrive with reinforcements.